PLAST-PRO is an axially-restrained full coupling and insert set, allowing quick and simple installation of pressure pipes made of polyethylene (PE). The full sets are available for pipes in dimensions SDR 11 (63.0mm – 110.0mm, PN 16) and SDR 17 (125.0mm – 355.0mm, PN10). ​PLAST-PRO is particularly suitable for water, waste water, mining, industrial plants and maintenance applications. Economical - for use in lower temperature and pressure ranges. pipe diameter differences (see below). ​This ready-to-use coupling is removable and reusable, and due to its slim casing, even more space saving. applications in plant engineering and process technology. 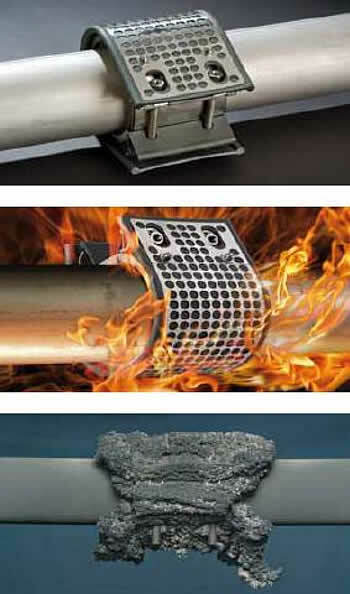 STRAUB ECO GRIP may also be used on plastic pipes such as PVC, ABS and CPVC. Whether pressure or suction lines, all piping systems are installed quickly, safely and economically with STRAUB GRIP-L.
A special advantage is the light weight and the single bolt on the smaller diameters. The Straub Metal Grip is the ultimate axial restraint (pull-out resistant) pipe coupling for all plain-ended metal pipes, with outstanding performance. 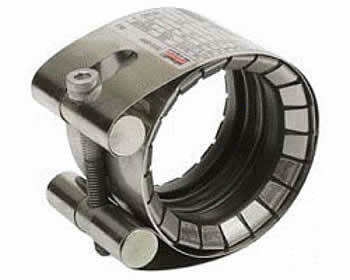 STRAUB PLAST GRIP ø 40.0 - 160.0 mmAxial restraint pipe coupling for plain-ended plastic pipes. Used in the gas and water supply industries as well as in industrial pipe line construction. For vacuum or pressure pipes, for thick-walled PE pipes (require stiffening rings) as well as thin-walled PVC pipes. The STRAUB PLAST GRIP is the ideal way of connecting plastic pipes. Example of an application - Potable Water Processing, Local Community of Saviese, Switzerland: Supply line connected with STRAUB PLAST GRIP 110 mm. STRAUB COMBI GRIP ø 40.0 - 160.0 mmPractical - for transitions. The STRAUB-COMBI-GRIP ensures a perfect connection at transitions between plastic and metal pipes. The advanced technology and high-specification manufacture ensure increased safety and reliability wherever this coupling is used. Joins plain-ended plastic and metal pipes and compensates for differing outside diameters. Non-weathering and no pipe-end machining required. Note PE pipes require stiffening rings. Fire safety system for alcohol tank farm in Switzerland - Fire-fighting water pipes with transitions from stainless steel to plastic (PE). The Straub-Flex is a range of axially flexible pipe couplings suitable for all pipe materials. Versatile - connection and compensator in one. 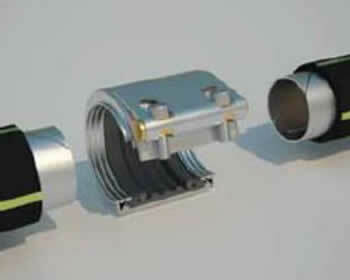 The multifunctional, axially flexible pipe coupling for all pipe materials. For water supply, sewage treatment, mining, industrial plants, power plants and shipbuilding. Straub-Flex absorbs noise, vibrations, and small amounts of expansion and contraction. 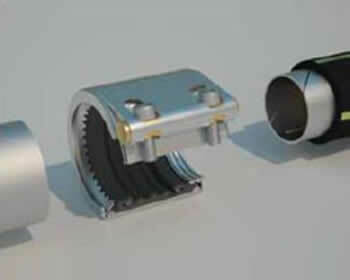 Straub-Flex ranges from 47mm to 4064mm clamping ability. 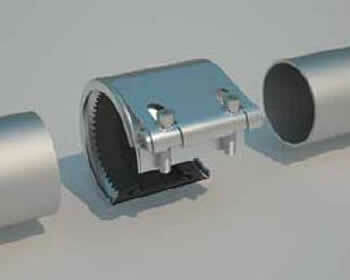 Non axial-restraint pipe coupling for joining plain-ended pipes with diameter differences up to 30 mm. The dimensions and properties of STRAUB STEP FLEX are the same as those of STRAUB-FLEX 2 and 3. 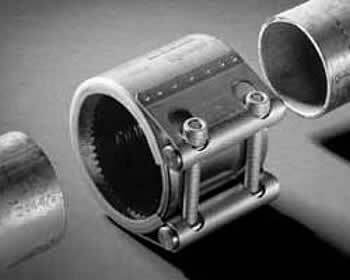 The Straub Open-Flex is a range of hinged, non-axial-restraint, pipe couplings for pipes of all materials. The Straub OPEN-FLEX is available in a number of different versions: hinged, one-piece or two-piece casing. The specifications and properties are the same as for the STRAUB-FLEX with slightly reduced working pressure. The great advantage of STRAUB OPEN-FLEX is that it can be fitted to existing pipes in situ, without any need to remove and re-lay the pipes. This makes it the ideal solution for permanent repairs of pipe joints, cracks, etc. Simple and reliable. 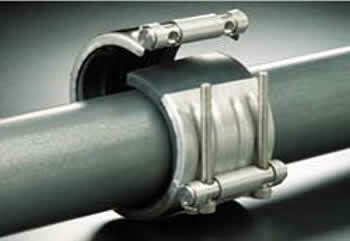 The fire resistant coupling for use wherever fire protection is required by law. The STRAUB FIRE-FENCE combines functional design with latest technologies. The pipe coupling is based on the reliable and well proven STRAUB coupling system and fulfils IMO (International Maritime Organisation) and IACS (International Association of Classification Societies) requirements alike, which have been in force since 1.1.2007. Even with its flame protection, the coupling is space-saving, shows significantly improved crush resistance and, thanks to the innovative design, is also lighter than its predecessor or any comparable competitor's product.